Sauber C32 launchSauber revealed its 2013 Formula 1 contender, the C32, in an event at its Hinwil headquarters in Switzerland on Saturday morning. The team enjoyed one of its most successful seasons in its history in 2012, as it claimed four podium finishes and finished sixth in the constructors' championship. Team boss Monisha Kaltenborn said that given last year's results, Sauber wanted to build on the previous car's strong points rather than starting afresh. "I'm very excited, but also a little tense," she said. "The aim is very clear and simple: we want to continue to improve ourselves. 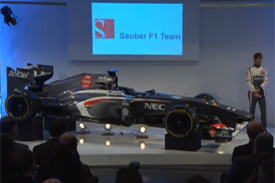 "The Sauber C32 is based on its predecessor, which was a very competitive car. "It had a lot of strengths and some weaknesses, and our engineers have worked to build on those strengths and eliminate the weaknesses." The car has an all-new, largely grey, livery and runs a 'vanity panel' on its nose as well as notably small sidepods. is it black or anthracite? Is Lotus the only car with a stepped nose? If you looked at the front view of the Sauber, you can see that they only put on panels on 2-sides, the step nose still visible there, and maybe they channel the air down from the side vanes to get extra downforce, clever ideas. I think this is what Allison talked about, if teams can find some clever ways to use the panel for performance gain then they'll do it.